On Tuesday, March 1st the Board of Directors at Ross Stores (ROST) approved an increase to their quarterly dividend. The new dividend rate is $0.135 which is an excellent 14.9% increase from the previous payout of $0.1175. 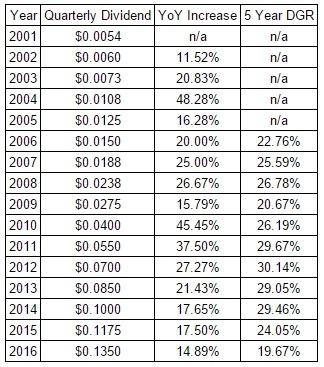 The dividend has been increased 21 consecutive years since its inception in 1994. The current yield on Ross Stores shares stands at 0.94%. I own 56.131 shares of Ross Stores in my FI Portfolio so this dividend increase grew my forward 12-month dividends by $3.93. This is the 1st dividend increase I've received from Ross Stores since initiating a position in early 2015. And what an increase it was! According to USInflationCalculator the total inflation for that same time period sits at 0% so Ross Stores is absolutely crushing inflation with its dividend growth. The average analyst estimate for earnings for fiscal year 2017 is $2.76. Based on the new quarterly dividend rate the 2017 forward payout ratio is at 19.6%. Based on fiscal year 2016 free cash flow and shares outstanding the trailing free cash flow payout ratio is at 22.9%. While the current yield for Ross Stores is relatively low at just 0.94% they make up for it with excellent growth. The payout ratio is really low but they share the underlying growth of the company year in and year out via higher dividends and share buybacks. 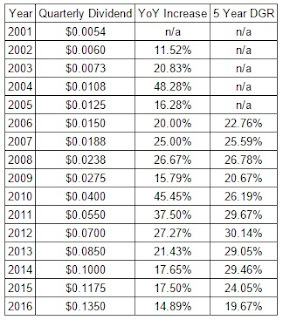 Their dividend growth has been phenomenal since 2001 with the lowest annual raise being 11.5% and the lowest 5 year annualized dividend growth rate of 19.7%. Ross Stores is a discount retailer that is going through massive growth. During fiscal year 2016 they increased the store count by 84 to 1,446 or a 6% increase. While many companies would increase their debt levels to help fuel faster expansion Ross Stores has been very conservative with a long term debt to equity ratio of just 0.16 at the end of fiscal year 2016 which is an improvement from fiscal year 2015's ratio of 0.17. My forward dividends increased by $3.93 with me doing nothing. That's right, absolutely nothing to contribute to their operations. Based on my portfolio's current yield of 3.15% this raise is like I invested an extra $125 in capital. Except that I didn't! One of the companies I own just decided to send more cash my way. That's how you can eventually reach the crossover point where your dividends received exceed your expenses. That's DIVIDEND GROWTH INVESTING AT WORK! 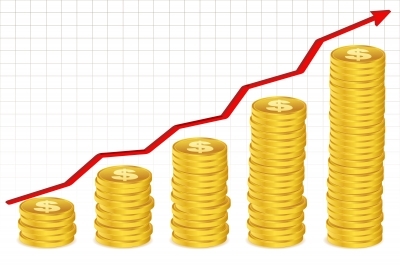 That's the beauty of the dividend growth investing strategy because you build up your dividends through fresh capital investment as well dividend increases from the companies you own. I've now received 11 dividend increases thus far in 2016 adding $58.22 to my forward 12-month dividends. This is also the second raise from my holdings so far in March after Bank of Nova Scotia announced an increase early on Tuesday. My FI Portfolio's forward-12 month dividends are up to $5,556.18 and including my Loyal3 portfolio's forward dividends of $62.68 brings my total taxable account forward dividends to $5,618.86. Have you considered Ross Stores for your own dividend growth portfolio? I haven't reviewed the financials but I like Ross as a store. I bought three t-shirts there last week and got fair pricing on all. Ross Stores' financials are solid. The biggest risk that I see is how much market share Amazon can take for the clothing industry. Buying books or gadgets or electronics is great for Amazon but how many people will purchase clothes that might not fit or look right on them once they get the product. Personally I don't want to deal with the hassle of returning things so the less I have to do it the better. Impressive 11 dividend increase!! That's what I'm talking about! Try to get 11 pay raise increase within 2 month from your job! LOL :) Your boss would say "fat chance! Sayonara!" so quick heheheh. That's why since I found the dividend growth way, I'm in!! 11 increases through 2 months and a couple day is awesome and I'm really excited about it. Especially since only one, TROW, has been a bit disappointing but understandable. I expect them to rebound with a better increase and maybe a special dividend again next year. Congrats on getting more free money for no extra work, that is the power of dividends and owning good companies :) Good luck for more increases in the rest of 2016.